I have files created by a Kodak-branded, Canon digital camera from this century that can no longer be read. This is my second case of file obsolescence; the first being Kodak Photo CD files that cannot be read by any existing commonly used software (I did find a solution to reading Photo CD discs that involves a UNIX program and using Terminal to control it). Photos from the old Kodak/Canon camera are not readable with anything I can find. But fortunately I don’t care, because I don’t have an archive of photos from that camera. The idea of photo files becoming obsolete is a scary one, because it points out one of the great threats to society. Sometime in the future we will no longer be able to access our images with any existing software. A few years ago, while preparing for a show in the local art museum, I scanned a number of five-foot-long strips of Kodak Cirkut camera film. Some of these film negatives were more than 100 years old. They still work perfectly; there are clearly visible images on them, and they were transferred to digital files by scanning. I would like to know that photos I take today will still be useful 100 years from now. Current file types including most camera-specific Camera Raw files will probably not be legible beyond a decade or two, and the companies that make the cameras that create proprietary files have no incentive (in fact they have the opposite) to support their files beyond a reasonable period of time – ten years, 20 years? The constant pace of innovation and improvement in camera technology will drive this. Bigger sensors, better color capabilities, greater bit-depth, white point recording, expanded gamuts, and more (perhaps post-processing focus information can be encoded) will force camera manufacturers to move to more capable versions of Camera Raw, and perhaps we’ll have new storage technologies that supersede the SD card, and others that we find so handy today. It’s inevitable. At some point Canon, Sony and Nikon will each say, “Enough!” for their current storage schemes and they will move on. Adobe, which now supports hundreds of different Raw formats, will inevitably abandon support for the oldest of them and move on. And that will be the day that we need to go back to some 30-year-old image and open it anew. But on that day the image will not open. It will be lost to technological obsolescence. That will be a dark day. Fortunately we have a solution on hand today, one which will prevent obsolescence for some time, and one which we can all adopt immediately to stave-off the possibility of image obsolescence for a while. The idea of any software working in 100 years is unlikely, but not unimaginable. This file is the DNG – or Digital Negative file. It was created by Adobe in 2004, but has now been made available by that firm to the world community. It has also been offered to the International Standards Organization as an ISO standard, one that can continue to be used in open-source software, and one that may prevent, or at least forestall obsolescence. Professional archivists are encouraging everyone to use the DNG file to prevent file type obsolescence (as I am describing here). How do we get to DNG? 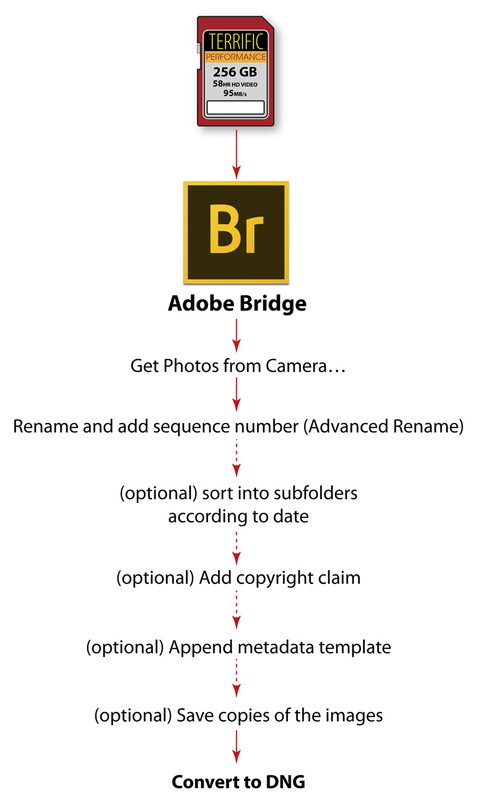 The simplest way to put our images into DNG format is to import images from camera cards using Adobe Bridge, and its companion application Photo Downloader. It can also delete the files from the camera card, something I do not recommend. I never delete a photo from a camera card until I am confident that the images are safely stored on a local computer. And, even then I don’t erase the camera memory card until the next time I use the camera. This is Adobe’s Photo Downloader application, which is accessible only from Adobe Bridge. Once there, choose Advanced Dialog to get to this window where the better features are available. This software is only available from the File menu in Adobe Bridge, which is only available to those who have the Adobe Creative Cloud. The technique: put a memory card into your computer, or to a card reader. Run Bridge, choose File>Get Photos from Camera, and then choose Advanced Dialog from the application that opens (it’s called Photo Downloader). Once in that application, choose the images you want to download (start by clicking the UnCheck All button). You can click on one image, then shift-click on the end of a range of photos. Non-contiguous selection does not work in this application, alas. Choose the destination folder in the upper-right corner. Choose whether to subdivide the images into folders, and by which criteria (I seldom do this). Then choose Advanced Rename, and choose Text + Sequence Number (and other variables that you may want). I always put a space after the text to separate it from the sequence number. Be sure to allow enough digits in the sequence number to accommodate all of your images. And, this is the most important part: Check the Convert to DNG check box. You can also add metadata from your own list of prepared metadata, you can add your own copyright claim to all of the images, and you can write copies of the photos to a back-up disk if you wish. Suppose you have a folder of Camera Raw photos on your hard drive, and you want to convert them to DNG. You would want to do this to create a DNG archive of images from those photos you have already stored on your hard drive. This is Adobe Camera Raw. In the lower-left corner is a button for saving in a variety of formats, among them DNG. This is useful for converting a number of Camera Raw files from their native type to DNG. 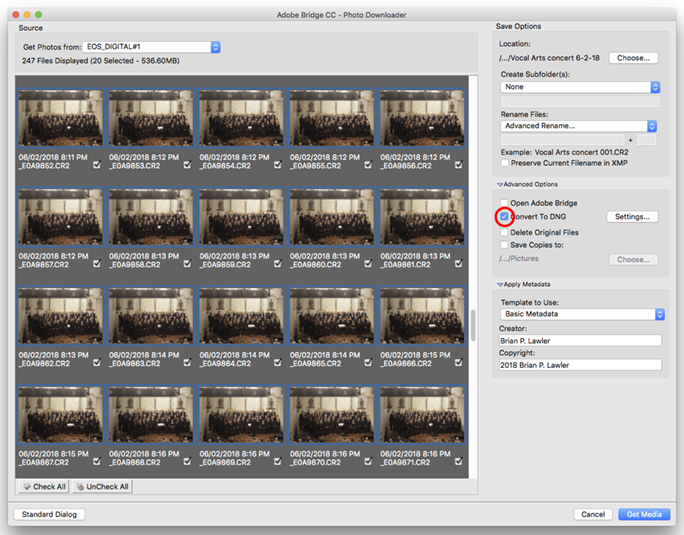 To convert one or more images from Camera Raw to DNG, chose a batch of images and hit Command-O (Open). This will cause the images to open in Adobe Camera Raw. You might get a warning dialog indicating that you have selected a large number of images to open at one time. Click Continue. Once they open in Camera Raw, select all (Command-A). Then choose the Save Images button in the lower-left corner of the window. A new dialog will open. Choose Save in Same Location (or you can save in a new location). Choose .dng as the image suffix, which will automatically select the conversion to DNG (though you can overrule this – don’t!). It will take about one second per image to convert the files. You can continue to do other things while this is happening. Another technique is to use the free Adobe DNG Image Converter. Download this and install it on your computer. It has a logical interface. 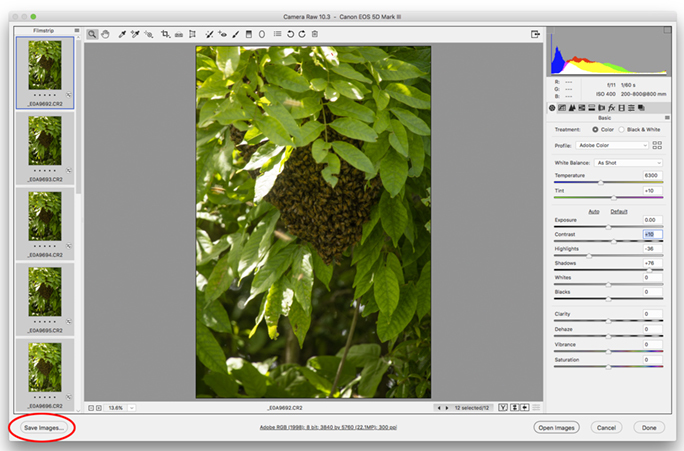 This application can convert Camera Raw images in any folder into DNG files. It does so quickly and effectively. Once the conversion is complete, you will have a folder with .dng files in it. Those images are saved in the most obsolescence-proof format currently available. You can be confident that your photos will work in the future. How long? No one knows, but I assure you it will be longer than if you do nothing with your files. If you take steps to import all new images into your computer in DNG format, and to archive your photos in DNG format, you may be able to avoid the dark day when you will no longer be able to read your photo files. DNG files have advantages beyond obsolescence-proofing. Those pesky .xmp “sidecar” files that are created when we open Camera Raw files on our computers are gone! (In fact the same data are embedded in the DNG files). This saves some occasional grief when working with images that have been opened previously when the .xmp file has been misplaced. Note: DNG will not convert from JPEG images. The file format is limited to Camera Raw files. I am also confident that JPEG images will be legible for many years, due to their ubilquity, but that is not a reason for using JPEG as your primary file type. JPEGs are not designed for archival purposes. This entry was posted in Photography, Photoshop techniques, Software, Technology, Uncategorized and tagged Adobe Camera Raw, Blognosticator, Brian Lawler, Camera Raw, Canon cr3 file type, converting to DNG, DNG file, DNG files, file obsolescence, obsolescence-proofing, preventing obsolescence. Bookmark the permalink.